It is the most fervent dream of every quilt designer to have one of her designs accepted into a major quilt show. Karen Brandt of Banning, California has made this dream come true for me. Have fun reading about Karen and her quilt. Thank you, Karen for making this dream come true for me. My guess is that it is also a dream come true for you. Have you voted for your favorite quilt yet? Voting will be closing on January 25th. Click here to vote for your favorite. 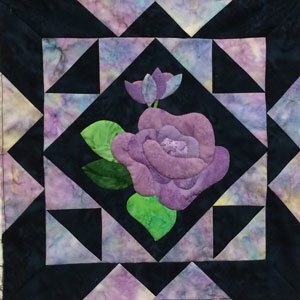 I went to an International Quilt Show at the Orange County Convention Center in Orlando. Lots of beautiful quilts. Jerry and I went to the Carriage Museum and I learned two important facts. 1) In the late 1800's, folks had as many choices in carriages as we have today in cars. 2) They detailed their carriages just as we detail our cars. Who would have guessed it. We also discovered that Stumpknockers is a great place to eat. We are starting a new, free, BOM. There is one change to the instructions concerning the yardage necessary for the quilt. There is a note after the download links that explain the problem, I'm sorry that I can't update the PDF file at this time. I'm in Florida and the base documents for the PDF file are in Iowa. This gorgeous version of “My Christmas Baltimore” was created by Karen Brandt of Banning, California. It has been juried into the 2016 Road to California in Ontario, California. Karen has designed her own border using an element (bow and baubles) from my border but has used 16 blocks from my “It’s A Baltimore Christmas” series. The quilt is breathtaking. We wish you the best of luck with it, Karen. She was astounded at the beauty of applique, and decided she could do such work too. 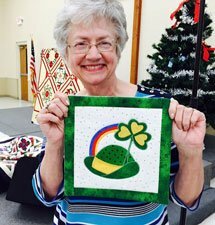 Shortly thereafter, in 2002, she took her first needle-turn applique class from Shirley Fletcher at the Piecemakers Country Store in Costa Mesa, California, producing a small wall hanging. 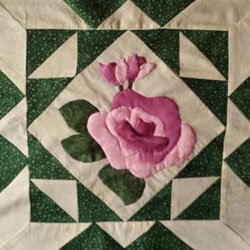 Her next project was a 25-block traditional Baltimore-style hand-quilted project. 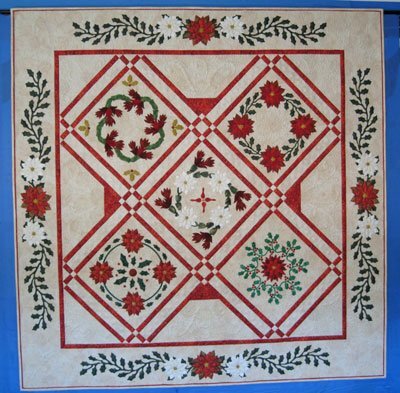 Karen has needle-turn appliqued somewhere around 25 quilts and wall hangings. She also found time to try fusible applique and piecing, but finds needle-turn to be her passion. Initially, Karen hand-quilted her projects. 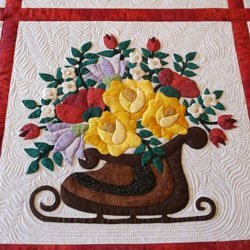 Deciding she liked to applique, not quilt, she now uses the services of a long-arm quilters. Karen has occasionally placed her quilts in shows, and has won awards for them, both locally and at Road to California. 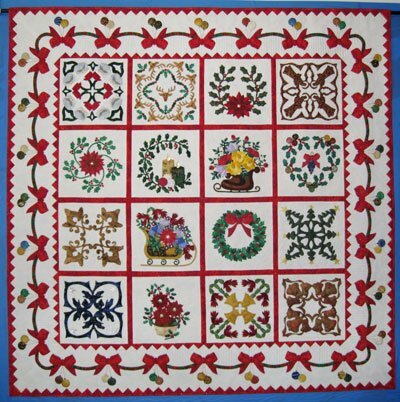 Karen’s “My Christmas Baltimore” quilt was machine quilted by Debbie Stanton. Debbie’s quilting is absolutely astonishing. It is elegant, graceful and perfect. 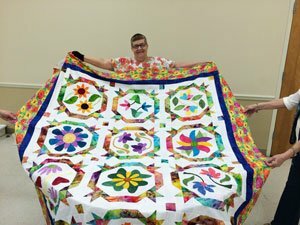 Debbie has recently received her second Exemplary Machine Quilting Award from Arizona Quilters Guild. 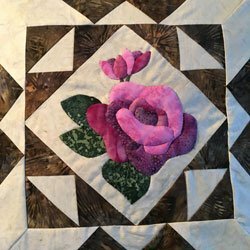 Here are links to the two quilt patterns of mine that Debbie has quilted, however, you will want to check out all of her work. Karen has also made my “Christmas Memories” quilt (left) and Debbie has quilted it. Gorgeous. We are busy completing our travel plans for this fall. I have openings for trunk shows and workshops between August 15, 2016 and September 8, 2016. We will be in the Wisconsin/Michigan/Ontario area during this time. If your quilt guild would like a free trunk show during this time, please contact me at abqhaidle@mchsi.com. The companion workshop is required at a modest price. If you have been to a national quilt show recently, you probably have seen the lovely quilts being offered for sale by the Tentmakers of Cairo. These quilts are extraordinary. Most are made by the men in the family. The larger ones are often made in just 4 months. Click here to see how they do it. It’s time to start another free BOM. This time the pattern is named for a good friend and quilter, Karen Johnson. The title can be a little deceptive. There isn't a hint of gingerbread in the quilt. This quilt is in honor of Karen's shop the Gingerbread House. Karen has closed her shop and is now retired but she definitely has not retired from quilting. She will be working along with us on this quilt. She and a friend, Georgie McKenzie of Boone, North Carolina will be making each month’s block with me. I’ll tell you more about each of them as the year progresses. My block to the upper right was sculpted with one layer of a flat placemat batting and one layer of a more poofy placemat batting. Sorry I don't know the brands. Karen's block is to the left; Georgie's to the right. Both gals chose to make their roses in pink and yet each of these flowers is unique. What colors will you use? This quilt will be a 44” x 58” throw or wall hanging. Each of us will be making a scrap quilt using batiks. Karen and I have decided to make all our backgrounds and pieced blocks using different fabrics in each block. Georgie will be using two shades of green for her background and pieced blocks. We will be alternating the block colors. That is, 6 of the blocks will have a dark background in the center and the other six will have a light background in the center. We hope these blocks will help you formulate your ideas for your quilt. This month I will also publish the instructions for the quilt. The instructions include a full size paper piecing patterns for the block. I’m sorry about the outside row. I was only able to get one on a letter size sheet of paper. Karen had a great idea. Copy that pattern 3 times. Cut out the 3 paper piecing patterns. Tape together a legal size sheet of paper then tape the 3 patterns to that legal size sheet. Take these to your local office supply and they will be able to copy them onto legal size sheets. It will only take 16 sheets rather than 48. After you make your block, I would love to have a photo of it. I'm starting a page in my Gallery just for photos of your blocks. I'll put Karen's and Georgie's photos on the first page to get us started. Click on this link to open an e-mail to me at abqhaidle@mchsi.com Attach your photo to the e-mail and give me your name and city/state. You don't have to crop or size the photo. I'll take care of that. I would suggest placing your block on the back of a sofa - as straight as possible. Then take it's photo. Sculpting shows up well if the only lighting for the block comes from either the left or the right and the flash doesn't go off on your camera. We will be sculpting (padding) the flowers and leaves on our blocks. You can learn how to do this on my DVD – Volume 2: Let the Fun Begin. I also want to include some additional tips here. This may be the first time you have used this technique and I think these additional tips may help you. It is fun to try out various battings to see the look they will produce. I’m going to be using various battings for my blocks. Each month I’ll tell you about those battings, why I like them or don’t like them, and where I would use them. I’ll start off by providing this information on both January and February’s block. It may make it easier for you to decide what to use. January: I used two batts for this block. Each batt was a placemat or table runner batt that can be purchased at your quilt shop. One of the batts was very flat. The second batt had more of a loft on one side. I’m sorry I don’t have the brand of each of these batts. Both were purchased several years ago and I didn’t write down that information. I didn’t sculpt the stems. For each of the other elements I first laid down a piece of the flat batt then added a piece of the lofty batt (loft side up) over the first batt. I treated them as one batt as I proceeded. Evaluation: I really like this look. The elements are all firm but not hard. I have also used this look on another throw that I’m making. February: I used a single layer of white Hobbs 80/20™ all elements in this block. This batt didn’t have much of a loft. Evaluation: Personally I felt it was too flat. However, when taking an unofficial poll of quilting friends, they were about evenly divided. Some liked the look, some didn’t. When using a batt with a scrim, place the scrim side against the background fabric. Have 3 height layers or example: (This tip is for the use of more than one batt. It’s your choice as to whether or not you do this.) Use no batt for stems, one batt for leaves and two batts for petals. Use lots of tiny stitches close together to control edge . Wider seam allowances: 1/8 - 3/16 When I first started I cut my seam allowance wider. By the time I was to the end of the quilt top I was back to using a 1/8” seam allowance. Do what is comfortable for you. Use stab stitch to anchor batting This is the first step. You do not want to pull this thread tight. It would leave indentures in the batting that might show on the front. As you applique, crossing a padded area is hard. Stitches are often too long. To solve: go around again putting each new stitch between two old stitches. Start at beginning of crossing padded area then you can easily continue on after you come around. This is important. Little tiny stitches control our edge. It is almost impossible to do that when stitching over a previously placed petal. I found that just stitching that area twice worked well. I placed the stitches in the second round between the stitches in the first. Knot quick prep stitching thread to help keep stitches in place. Normally I don’t knot my basting threads but when sculpting a petal or leaf the batt pushes the fabric away from the background. To pull it into place for stitching, I knot both ends of my basting thread. Then pull so that the batting flattens against the background fabric. Use appliqué pillow with a gentle curve to old each piece. I’m a big believer in using an appliqué pillow. For me this is an old 14" square throw pillow that I no longer use on a sofa. I place it in my lap to hold my hands while I quilt. It not only eases the strain on shoulders, arms and hands, it also provides a stability to your work that just holding your project in the air doesn’t provide. If you have a problem cutting out the batting and are using more than one batting, just cut the thru the top layer first. Then cut thru the second layer using the top layer as a guide. Clip 1/8th off points. We want sharp points so adding batting won’t help the cause. Clip 1/8th off the point. You should have enough seam allowance to full in the missing batting when you actually appliqué the patch. If you come up with additional tips I would love to hear about them. I’ll try them out and share them with my readers. Click here to send me an additional tip. Click here to get PDF file of Block 1 of Karen's Gingerbread Florals. Please note: There is a typo on page 2 of the instructions. You need to cut 17 - 2 1/2" x 12 1/2" strips for the sashing rather than 7. Sorry for the error. Important Note: Karen pointed out that the yardage for the outer border (1 1/8 yards) was too close for comfort. She managed to just get the binding cut. We recommend that you increase the yardage for the outer border from 1 1/8 yards to at least 1 1/4 yards. 1 1/2 yards would be much safer. of Ocala, Florida We had a great crowd. I had great quilt holders. Thanks gals. I couldn't have done it without you. Photo by Kathleen Estes, a guest at the trunk show. Kathleen also took the photo of me holding "St. Patrick's Day." 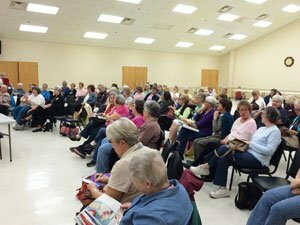 We had a wonderful time with the Country Road Quilters of Ocala, Florida. Jan and Karen made our visit very successful. Thanks so much. 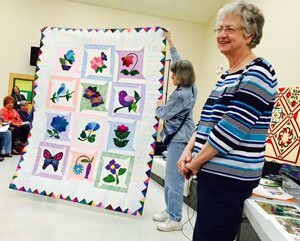 Jan Smith, guild president, showed her "Pushin' Up Spring" quilt. 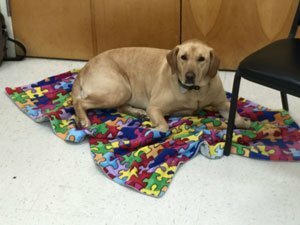 Love your color selection, Jan. Daisy was such a good dog. This was her first trunk show. She stayed on her blanket the whole time.